The wonderful Velo Bellas have brought back the Surf City series. 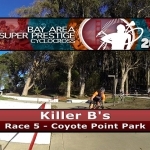 This is one of NorCal’s best cyclocross series. Come along and race with the Women and watch as they mix it up. Jump to the Cycling videos to watch.